I love coming to our Siem Reap office to meet up with Tom, our Cambodia office director, & all his friendly office staff. All these boys & girls are working very hard to get the hotels & international & domestic flights for all our clients, and their happy & friendly faces are very welcoming. After lunch we drove out to Tonlesap Great Lake for a boat trip on the lake. Many of our clients have already taken this trip on a private boat through floating villages all the way out to the Great Lake itself. This is a very pleasant way to see the local people's life on the lake. The children swimming & bathing in the water, the women washing dishes or clothing & men on the boats sailing by are all part of the daily life on the water. In the dry season when the water is low the whole floating village will move to another place. Next morning we drove about one hour out of town to visit the Beng Melea temple. 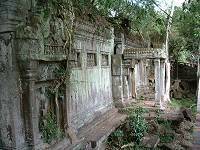 This temple was built by King Suryavarman II in the 12th Century & is now a ruin. The whole building has collapsed through the years. 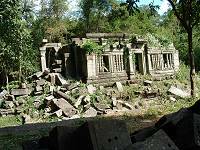 The remains are chunks of stone & brick that have fallen from the temple resting around the complex. There are some half the walls & doors remaining among the trees & their roots. In the afternoon we inspected one of the most amazing hotels in Siem Reap town, the Hotel De La Paix. Constructed in 1955 and having weathered many turbulent years the hotel was demolished in 2003 & is now re-built in an ultra-chic art-deco style. The wonderful inner garden is beautiful & relaxing. The Garden court suites are magnificent, the bathtub is found in the private courtyard after stepping through the door, and the bedroom is beyond. This is great hotel for anyone who is looking for an unconventional place to stay. Next morning we rose early at about 6am and drove to Tonlesap Lake again for our boat journey by public boat to Phnom Penh. We were the first to arrive, boarded and grabbed the front seats. The boat has about 60 seats but they are quickly taken as more people arrive. The seats are all inside the boat while you can also sit on the top of the boat by climbing up. 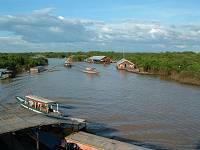 There are good views from the top of the boat and the journey from Siem Reap to Phnom Penh takes about 4 to 5 hours. There is no café facility, just seats & one (basic) toilet. 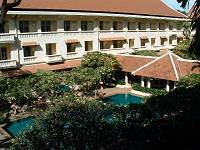 We arrived at Phnom Penh & transferred to the 5* Raffles Le Royal. This is a hotel I have always wanted to stay at. The grandeur of yesteryear remains throughout the hotel right from the front door as we stepped into the elegant lobby. The corridors with black & white tiles, the antique furniture & the lovely ceiling lamps are reminders of bygone days. The new wing of the hotel is also cleverly built to the exact same classic design. Mr. Wong, Director of Sales & Marketing, had kindly located our room in the original old wing. The bathroom of our room had the original 1920 classic fittings, beautifully renovated. The bedroom door opened to a small balcony with a lovely view of the beautiful swimming pool in the inner courtyard garden. We went out to lunch at 3* Phnom Penh hotel, a very popular hotel that we use for our standard hotel category guests. It is a very good 3* hotel with lots of 4* hotel facilities such as swimming pool & spa. There are also 4 choices of restaurant in the hotel. We had a wonderful buffet lunch with a lot of seafood salad & seafood main dishes etc. The desert was a mouth-watering selection of western & asian cakes & deserts. We went back to Raffles in the afternoon to relax by the pool. We enjoyed these few hours of luxury at leisure in the lovely courtyard surrounded by creamy white building with balconies & shutters. This is my favourite classic hotel. Next morning I had the best breakfast in Raffles Le Royal, a huge selection, the best of which was the beautifully presented poached egg on ham on a small muffin. It looked great & tasted as good as it looked. The setting is the classic long veranda with potted palms between tables covered in white cloths & wicker chairs. It reminded me of the Continental hotel in Saigon in the Sixties. 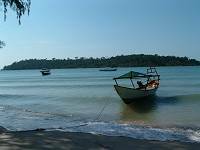 We left Raffles & drove 4 hours down to the coast at Sihanoukville. One thing in this inspection trip that we had never done before was to meet our clients whose paths we were due to cross on our travels. Although we missed meeting our clients at the Sokha Beach Resort we were able to meet several more clients over the next few days. We inspected this lovely beach resort with the general manager, Mr. Bernard. Sokha is the only 4* hotel in Sihanoukville (actually the only 4* beach resort in Cambodia) in a very good location with a private hotel beach. 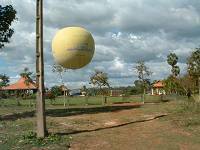 The resort is quite large with tropical gardens, swimming pool, tennis court etc. The most delightful part of the hotel is is the seafood restaurant built on a deck over the sandy beach. This would be a very romantic evening venue for dinner for a couple. We are very happy with the resort & carry on using it in both superior & deluxe categories. We also visited our standard hotel in Sihanoukeville, the 3* Seaside hotel. This is quite a charming little hotel full of local style by the beach. They have a restaurant & beach chairs on the beach that belong to the hotel. 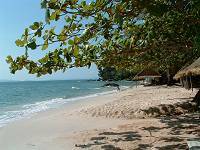 This is the beach that you mix with all the locals, but none of the beaches in Sihanoukville could be described as crowded! We drove back to Phnom Penh & checked in at the 4* Cambodiana hotel, which we have used for some years. The hotel has a very good location by the river. It is very pleasant to stroll along the waterfront in the evening.